It’s commonly accepted wisdom that cooking at home is always a preferable options to eating out. The thinking goes that cooking your own meals is less expensive and usually healthier than a meal out at a restaurant, especially for a family. Is that always true, though? Not necessarily. There are some surprising benefits to eating out. In fact, having a night or two every week dedicated to dining out can be a great way for you and your family to bond, and it can even help your kids mature and develop. Does this sound familiar? You get home from work and have a few minutes to set your stuff down before you scramble to prepare a meal. While you and your family are eating, one kid is watching their tablet while the other is texting with their friends. Your spouse is occupied with a work problem and you’re already dreading doing the dishes after dinner. Meanwhile, the television is blaring in the background. Eating out is an escape from the distractions at home. You can leave the tablets and gaming devices in the car. Make a rule that no cell phones will make an appearance while you’re in the restaurant. And you certainly won’t have to worry about preparing a meal or cleaning up after. Instead, you and your family can enjoy conversation without all the distractions. Schedule a night out once a week so your family can enjoy time with each other. Dining out is a great way to celebrate accomplishments, big or small. One of the best ways to boost your kid’s self-esteem is to celebrate their accomplishments. What better way to celebrate than by taking them out for a special dinner? The next time your child aces their test, has a great musical performance, or even just behaves well around the house, consider rewarding that behavior with a celebratory dinner. It gives you a nice reason to dine out and it gives them a boost in confidence. Don't think your child is ready for fine dining? You may be wrong, check out these 7 tips on avoiding chaos when eating at upscale restaurants with kids. Dining out helps your children develop manners and communication skills. Every parent wants their kid to be mature and well-mannered. Dining out is a great way for your child to practice those skills. They get the opportunity to say “please” when ordering and “thank you” when their server delivers something to the table. They may even become comfortable with reading the menu, choosing an item, and ordering it themselves. During dinner, they can practice using their silverware correctly and keeping their napkin in their lap. While these may seem like small steps, they’re important life skills. If your child learns good manners at an early age, they’ll come across as being mature and respectful. It’s a great way to introduce children to new foods. Yes, chicken nuggets and mac n’ cheese may be your child’s favorites, but you’re probably looking for ways to expand their palette. Dining out can offer a great low-stakes way to introduce them to new foods. Your kids can order a chicken dish or cheeseburger with which they may be familiar, but then they may be able to sample a different appetizer or even take a bite or two from your plate. Eating out gives them a chance to try new foods without committing to an entire meal. Plus, you can introduce them to a new food without cooking a full dinner, unsure of whether it will get eaten or not. The prevailing wisdom is that cooking at home is always healthier than eating out because you get to control the ingredients at home. However, that’s only true if you’re actually cooking fresh meals with healthy ingredients. If you’re heating up fast, frozen meals or if you’re cooking with a lot of butter, salt, and fatty ingredients, there may not be much health benefit to eating in as you think. In fact, in some cases, eating at home could even be less healthy than eating out. At Jag’s, we offer a number of healthy salads, seafood dishes, and lean chicken meals that are nutritious and delicious. 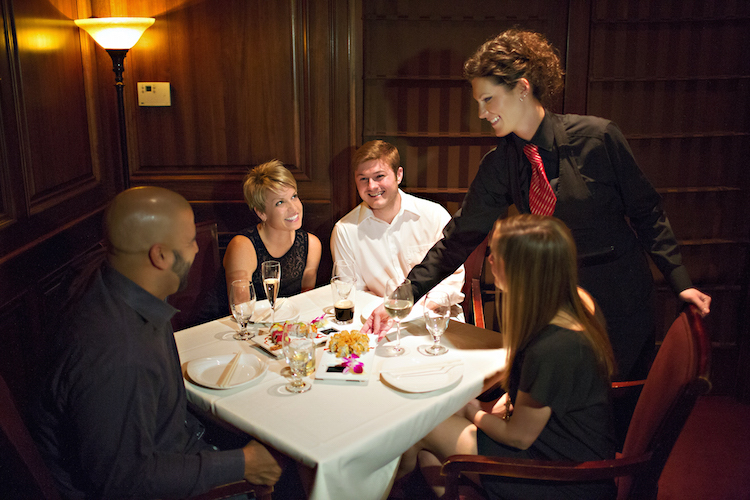 For your next family night out, make a reservation at Jag’s. We look forward to providing you and your family with a wonderful dining experience.